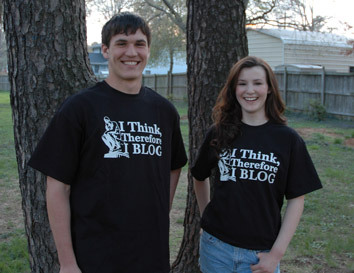 At last we are ready to unveil the long-awaited and eagerly antcipated "I Think Therefore I Blog" t-shirts. Here you can see a couple of fine looking young people modeling this shirt, and if you want a close-up of the artwork itself, you can find it at the bottom of this page. This is sure to become the shirt you can't do without and that makes a great gift for bloggers everywhere. Mrs. Jolly and I are hoping we can sell a few of these shirts to offset the cost of my blogging addiction. If they go over well I'd like to start saving toward a new laptop, since ol' faithful here is getting old and not so faithful anymore. I've actually had the shirts for awhile but just got around to enlisting help from my friend Tim Challies in setting up online payments, so a big thanks goes to Tim. We are ready to roll and take orders now, so if you would like one of these shirts hit one of the "Buy Now" buttons below. The plan is to set up a permanent page where you can order these shirts, and this should be ready by the end of the week. Once that is ready I'll start doing some advertising and I'll also put up an ad at the top right of the blog here. Also, for now the price includes shipping within the US. When I can nail down the costs of international shipping I'll make that available and put it on the more official looking permanent page. The shirts themselves are high quality 6.1 oz Gildan Ultra Cotton Heavyweights with a durable silk-screened image for quality. So, if you want to be the first in your blog neighborhood to have one just select a size and hit the "Buy Now" button below. The cost is $15.00 for Small - Extra Large and $16.00 for the XXL, plus shipping. And, since we're just getting started with this, please allow up to two weeks for delivery. As we get it going we hope to be able to give quicker turnarounds. Is it OK if I use that graphic on my blog? That would be great - I'll take all the publicity I can get. Indeed - and such handsome and beautiful models must have some really oustanding parents, don't you think? The Fattriplets are getting together for the weekend and would like three t-shirts by tomorrow. Would that be possible? I will pay for the t-shirts and the shipping. We want to take a picture of the three of us in the shirt and post it on our website. I called the number at your church and got a maching. Just got it in the mail... too cool (or is that nerdy?)... whatever... I like it! Hey there - I'm promoting your shirt on my site so I'm linking to the jpg. FYI. If there's a problem, email me at lovelyladykat@hotmail.com and I'll remove it promptly. The payment stuff isn't working. 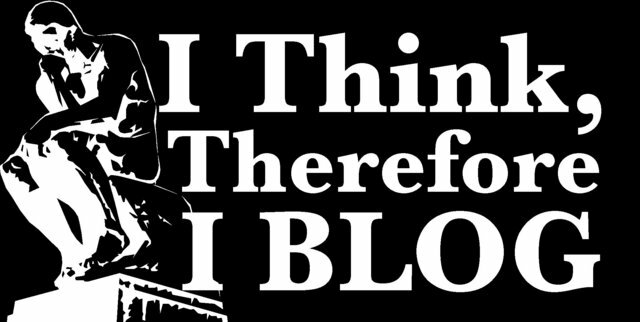 I like the phrase of the tee shirt, "I think therefore I blog"...seems a nice gift to all my friends who loves blogging too. What a perfect gift idea with Christmas around the corner. Great shirt! It nice and great gift for bloggers. After reading this article definitely people will want to purchase and wear the t shirts....It is rocking !!! Excellent blog !!! Nice to read it. Those look some great shirts. T-shirts are like canvas to me. They can be like moving pieces of art, allow one to communicate, celebrate, provoque, whatever is important in our lives. Originality is key. I support any individual or group that wants to produce unique, quality material for the demanding individual. Greetings to you in the most precious name of our Lord and saviour Jesus Christ. Let me introduce myself that my Name is P. Ephraim, pastor. We have established a Christian Organization named "Society of the Prince of Peace" with the Help of some Faithful Christians. We established this society only because that we can proclaim the spirit of God in our Area. Some of our Gospel Teams have been Distributing the Bible free Tracts and Booklets in the particular centers Hospitals, Educational Centers and some Remote villages of our Area. By the Grace of God we are running a Christian Lending Library named “AGAPE” Lending Library in my Area. So many people are come and search the scriptures and saved their souls to our Lord’s kingdom through these scriptures. I will be able to succeed this program. So we request you please pray for my spiritual need and send some Bibles, Bible based material to my library purpose. Brother, we have a good team of youth 15 members, they are all involved Tracts distributions, street preaching and they are visit to some remote villages and proclaim the God’s words and distribute the free tracts and New testaments and some Bibles. And we maintained Medicinal camps in remote villages of our area. So we request you send some free medicines and used clothes to distribute the poor people in my area. So please consider my request and arrange above my requests. Brother we pray for you and your families and also your ministries in my day to day prayers. Please pray for me and my ministry in my area. God bless you richly in this year2008. Brother, if you possible please provide here in my area, Your Gospel messages are relay to free media. Here so many free media channels are broadcast some business, Films and etc, but there is no our Gospel messages free Media in my state (Andhra Pradesh). So, brother, please consider my request and provide your material and support to start the Gospel Messages free Media (FM)Free Media; here so many people are used free media sets, audio. I am waiting for your prayerful reply.